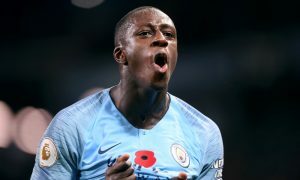 Manchester City are without injury prone left-back pair Benjamin Mendy and Fabian Delph for Tuesday night’s game with Hoffenheim, with the two also a doubt for Sunday’s crunch clash against Liverpool at Anfield. Pep Guardiola confirmed that Delph will not be back this week, and although Mendy is “training much better”, the City boss couldn’t say whether he’d be back for the Liverpool match. That could mean Oleksandr Zinchenko, who impressed against Oxford and Brighton, retaining his spot on the left for both games. Danilo, who is fit again, is another option for the left side and in fact was used in that position in the 4-3 defeat to Liverpool in January. “Delph will not be back this week,” said Pep when quizzied about the availability of his left-backs. “Mendy is training much better, but I don’t know exactly when he will be ready. “Oleks (Zinchenko) helped us a lot last season. All players know they are part of a team.